Last Friday, January 5, we lost a good and great leader in our state. His name is Floyd Jones. Floyd died at the age of 90, having lost a battle with cancer, but more importantly, having worked for and won a life of personal success and social good. Floyd grew up in dire poverty, as a sharecropper in Arkansas (those were landless farm workers in the South, who had to give to the landowner a share of whatever crop they raised). Floyd migrated to California and joined the US Army at the end of World War II. Through that experience, thanks to FDR’s GI bill, Floyd’s way to the University of Washington was paid in full by the US Government. He majored in business, and became an extremely astute and successful financial investor. Floyd did not sit on his wealth. He put it to work for the benefit of others, in both big and small ways. As one example, and only an example, in 2014 Floyd gave $10 million for an endowment for the ACLU, particularly to fund work to end mass incarceration and create pathways for actual rehabilitation. In 2016, Floyd contributed $10 million for the construction of the Stanwood YMCA. 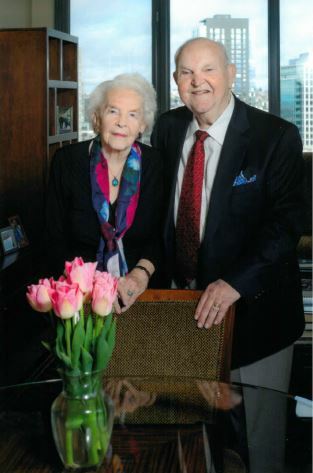 In planning his legacy, Floyd designated multi-million gifts to twenty non-profit organizations. Floyd called me up last February and said he would like to meet. Little did I know that at this meeting, he would suggest a very generous endowment to the Economic Opportunity Institute from his estate. He did, and we agreed that the earnings from this endowment would help cover our staff costs, year after year, in perpetuity. Floyd’s generosity enables us to pursue systemic progress in our city and state, as we did last year with passage of paid family and medical leave statewide, and passage of the income tax on the affluent in Seattle. We have much systemic progress in front of us and Floyd’s incredible generosity makes that progress possible. Floyd was a poet, an astute investor, and a philanthropist who gave to organizations out of all proportion to his income and wealth. He knew that the US government had helped him climb up from picking cotton in poverty to funding his education at the University of Washington as the first person in his family to go to college. He was a modest man. He treated all the people he met with respect and consideration. He didn’t think he was better than any of us. He simply wanted all citizens to access the steps up that he had as a young person. With his support, we are able to move that dream forward in our city and state. Floyd’s humor was abundant. His zest for life was unquenched. He literally danced all his life, cutting some spirited steps even in the last year of his life. He is our funder. But most of all, he has been our friend. We mourn his passing at the Economic Opportunity Institute.